Flappy Bird - the legendary game has reached the innards of the good old Commodore 64! Yes, it has been ported and it can be found for free over here: http://www.c64.com/games/2369 . It looks very easy but it is not. The sense of accomplishment one receives is actually quite amazing and it is disturbingly addictive. Zaxxon for the Apple II: Is it really a bad thing that this version of the game is not arcade perfect?It used to be that home videogame or computer translations of arcade games were judged on how closely they mimicked the source material. This included how many levels were brought over - memory constraints often meant that one or more stages were left on the cutting room floor (Donkey Kong translations were rarely complete, for instance) - how accurate the graphics and animation were (did Pac-Man look like Pac-Man? ), whether or not the sound captured the intended spirit (did Asteroids provide enough of a bass effect? 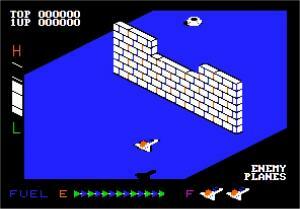 ), and how well the controls matched up (like angling the joystick for Q*bert), among many other areas.